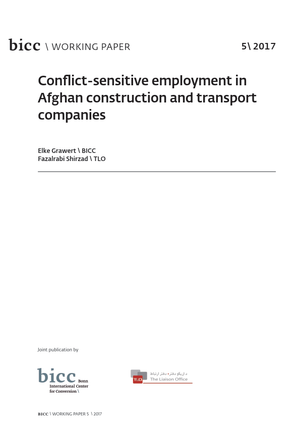 With the aim of identifying the challenges of and motives for conflict-sensitive employment, the authors Elke Grawert (BICC) and Fazalrabi Shirzad (The Liaison Office, TLO) present a qualitative study on construction and transport companies in Afghanistan, based on interviews with company owners and employees in 2015 and 2016. In BICC Working Paper 5\2017 they argue that—although the companies try to apply a wide range of employment strategies with conflict-reducing effects—a general policy framework for conflict-sensitive employment is futile under conditions of a fragile and conflict-affected setting, characterized by a high level of state corruption and a variety of local powerholders with different interests and the inclination to extract money from companies operating in areas under their control. These insights also point to a dilemma for development agencies in their pursuit of an agenda to create stability by engaging with the private sector. Whereas companies pursuing conflict-sensitive employment strategies may help to stabilize local communities, they also stabilize local power relations. Underpinned by micro-level data, the study thus contributes meaningfully to the ongoing debate on the potential role of the private sector in peacebuilding.